Usually, after the initial honeymoon period wears off – generally around the third or fourth book in a series – I begin to become wary. Whether it be Kate Daniels or Mercy Thompson, there always comes a time when my stomach churns, my mind imagines all the worst case scenarios, and I settle down to read a book with crossed fingers, toes, and hair strands. 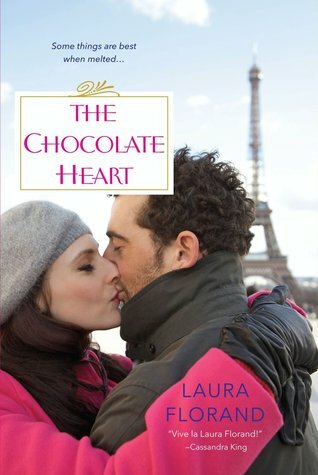 When it comes to Laura Florand, however, whose Amour et Chocolat series is made up of companion novels, my trust is never shaken. It’s a comfort to know that even if – by some strange chance of fate – I don’t fall head-over-heels for the love stories Florand writes, I always walk away besotted and impressed by her languid, graceful prose. Of course the setting of Paris, the chocolate-making heroes, and deeply complex heroines draw me in – but Florand’s writing always, always, clinches the deal. At this point in the series, it is of no surprise to see that Florand’s heroes share many similarities, whether it is their insecurities, vulnerabilities, or just their backgrounds. And yet, this device only adds to the complexity of Florand’s characters for, despite the similarities, each of these heroes possesses distinct differences. Luc, a world-renown chocolatier whose culinary presence has helped make the hotel where he works a 5 Star establishment, cannot be mistaken for Dominque Richard or Sylvain Marquis, although all three have grown up in the outskirts of Paris. Florand’s dual perspectives work effortlessly in creating well-rounded characters who seek to fit in, in more ways than their profession. I find that the more I read her work, the more I recognize qualities to praise. After all, Luc is living the dream in Paris, making food for famous guests and running his own kitchen, but there still remains so much unsatisfaction in his life. Enter: Summer Corey. It isn’t so much that Summer is beautiful or that she is able to able to fill up the blank spaces in Luc’s life, but rather the fact that he can add color to her existence that makes him pursue her with such determination. From the beginning itself, their attraction is selfless, seeking to understand one another and create a better world for themselves – together. Of course, the journey is slow, arduous, wrought with misunderstandings and an almost irritating back-and-forth banter, equal in wit, charm, and action. The Chocolate Heart isn’t my favorite of Florand’s love stories – that’s a definite tie between The Chocolate Thief and The Chocolate Kiss - but it contains other qualities that make it such a worthwhile read. Summer, for one, is a heroine whose plight I sympathized with. Not only is her beauty a detriment, isolating her from female companionship, but it also dampens her self-esteem. While everyone sees a pretty face in Summer, not to mention wealth, status, and power thanks to her father, they rarely ever see her. Summer is constantly admonished by her family, downtrodden and put-down, made only to carry out the wishes of her parents and marry the richest hunk they throw at her. Thus, Summer takes off for years, living on an island with no technology, no communication to the outside, and living with the locals, teaching them English and making a happy, sunny community for herself. When Summer is forced back to Paris by her father, whose gift is the hotel where Luc works, it is Summer’s worst nightmare. For one, her parents – though constantly complaining about her absence – don’t stick around long enough to see her and for another, Summer is intensely unhappy. An unhappy protagonist isn’t exactly likeable, but I loved Summer. Florand writes Summer’s insecurities with genuine feeling. It doesn’t seem contrived in the least that Summer thinks so lowly of herself, her abilities, and what she’s accomplished in life. It takes others to see the beauty in her – past the physical perfection – and Summer’s self-growth is slow, but realistically paced. I particularly love that, despite the happily-ever-after we all know and expect, Florand treats this fragile love story with a healthy dose of realism. For the first time, Florand has written an epilogue, but it is an authentic one, highlighting the truth of the bond Summer and Luc share in a way that is both bittersweet and romantic. It becomes harder and harder to write about this series with time. It only gets better – deeper, more complicated, and far messier. And yet, it is such a wonderful capsule of life. Even in the most romantic city in the world, life and its troubles never cease or escape you. Instead, you just learn to handle them…all with a healthy dose of chocolate, morning, noon, and night. I need to read this series Keertana! I'm starting to feel like the only person who hasn't, and I need to be in the loop. Normally the "it's so hard to be pretty" setup with a heroine would be a big problem for me, but it sounds like it's really well done in Summer's case and I have to admit to being curious about how well she works in this book. Glad this series is still going strong for you! I don't read that much contemporary, but I can really see myself enjoying the series, especially considering the setting and the really beautiful prose. It's comforting to know that it's still going strong, even in the fifth installment. I share your fear for the series I love and it's a bit stressful every time a new book comes out so it's great to know that at least this one is completely reliable. Whenever I see you review another one of these books, I want to go and eat chocolate, as well as start the first one! I have it, but I need to read it. A series that is consistently rated well from you, even several books in, is definitely something peaks my interest. Plus Paris, character growth and realistic but happy story is a big win. I think I liked the more abstract cover of the first book, however. Have they all been revamped? Hm... I don't read too much contemporary, but those that I have, I've enjoyed. Probably because I'm a bit pickier for those. I think this series would fit well. I love that this is strong in the 5th book. Adding this author to my must read list. I love that you're having such great success with this series Keertana. I know exactly what you mean about reading several books in a series and then feeling this huge trepidation about going into the next book thinking it will disappoint. Summer sounds like a fantastic character and one I'm sure that I wouldn't have a hard time connecting with. Also I love that you've mentioned that the epilogue is a real authentic one, I don't think I've come across a decent epilogue in a long time. Lovely review! RIGHT? Ever since the epilogue of Mockingjay I've been reading horrible epilogues everywhere, including Clockwork Princesses, so I was pleasantly surprised by this epilogue as well. I hope you enjoy the book, Jasprit! I love your review! I just finished this one and it's the second one in the series which I have read (The Chocolate Touch is the first). There are similarities between the two, but I liked this one more. It worked just perfectly for me. And the epilogue was great! Did you know that you can shorten your long links with AdFly and receive money for every visitor to your short links.